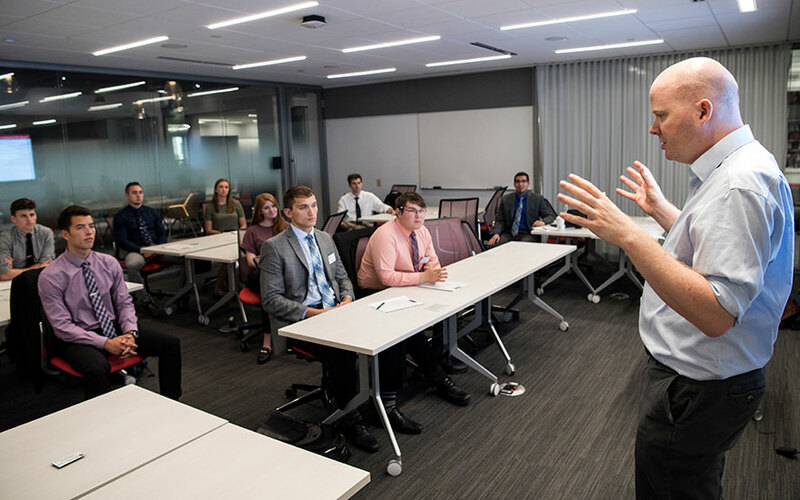 Enno Siemsen, associate dean of the MBA and master’s programs and the executive director of the Erdman Center for Operations and Technology Management, speaks to new PharmD students during their orientation at WSB’s Learning Commons. Photo by Paul L. Newby II. A new partnership between the Wisconsin School of Business and the University of Wisconsin–Madison School of Pharmacy will offer pharmacy students sought-after business skills and education through a four-course concentration in Operation and Technology Management (OTM). Beginning in Fall 2018, students in the Doctor of Pharmacy (PharmD) program can enroll in the Pharmacy OTM concentration, which offers students the opportunity to take MBA elective courses concurrently with the PharmD curriculum. Nine students are enrolled in the inaugural class and will learn alongside Wisconsin MBA students. The program was carefully designed and structured around students’ needs, says Enno Siemsen, associate dean of the MBA and master’s programs at WSB and the executive director of the Erdman Center for Operations and Technology Management. PharmD students listen to a speaker during the PharmD orientation. Photo by Paul L. Newby II. 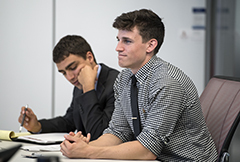 PharmD students enrolled in the OTM concentration must take a required project management course, plus three other elective courses such as managerial accounting, change management, health care operations, service operations, managing teams, negotiations, and logistics and supply chain. Participants complete the OTM courses during the second and third years of their four-year pharmacy program. To prepare PharmD students for success in these graduate-level business courses, WSB has created a custom-designed online module series that ensures readiness for students coming from nonbusiness backgrounds. Using a unique one-to-two day “boot camp” training format, supported by resources from the WSB Innovation Fund, the module series allows students to work through key concepts outside of the classroom before they begin the OTM concentration curriculum. With instructors identifying outcomes for each block of modules, the sequence ensures consistency and quality of knowledge for nonbusiness students enrolling in advanced business courses. The PharmD program itself currently enrolls approximately 130 to 150 students each year, with a future goal of 20 to 30 students choosing the OTM concentration annually. The collaboration also sets the stage for future cross-campus partnerships that could bring business education to professionals of many industries.